This is a great alternative to the typical stuffing and potato accompaniments for turkey. 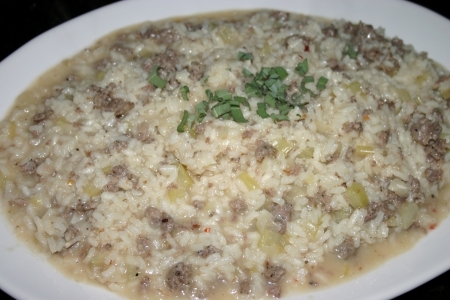 The risotto has all the flavors of fall and is easy to put together for your Thanksgiving meal or anytime of the year. I also wanted to create a dish that can be made for a smaller group or adjusted to a larger group if desired. Serve as is for a great meal or serve as a side dish with my Cornish Game Hens with a Savory Cranberry Port Sauce. For a creamier alternative substitute one can of lite or regular coconut milk for one can of chicken broth. Ingredient amounts will yield about 4 – 6 side dishes. Increase ingredient amounts if serving for a larger group. Using a large skillet add the oil, sausage, onions and celery and sauté over medium high heat until onions become translucent and sausage is browned and broken into smaller pieces. Add risotto to the skillet and stir for about a minute. Add the white wine and stir. Add the stock 1 cup at a time. Stir frequently adding stock when most has been absorbed, but not dry on the top. This process takes about 30 minutes. When the risotto is almost tender, stir in the parmesan cheese and kosher salt. Garnish with additional parmesan cheese and chopped sage leaves. Try Pedroncelli Pinot Noir (Russian River Valley, California), Rodney Strong Pinot Noir (California), Hahn Estates Meritage (California), Samuel Adams® Winter Lager (Boston MA), Chimay Ale Pères Trappistes Première (Known as Chimay Red) (Belgium), Flensburger Brauerei Pilsener Lager German Lager Beer or Flensburger Brauerei Gold Premium Lager Beer (Germany).